Republicans control the House, the Senate, 34 governor’s mansions, and 4,100 seats in state legislatures. But Democrats act like they run Washington. Nancy Pelosi’s speech to the 115th House of Representatives was a long-winded recitation of the same liberal agenda that has brought her party to its current low. Give her points for consistency I guess. Chuck Schumer is just being delusional. I suppose it’s too much to expect a graduate of Harvard Law School to grasp the difference between majority and minority. Mitch McConnell was able to block Garland’s appointment because the Republicans controlled the Senate. The Democrats do not. And McConnell was able to hold his caucus together because he was on solid historical ground. Lyndon Johnson’s nomination of Abe Fortas as chief justice failed in the election year 1968, and the so-called “Biden Rule” of 1992 stipulated no Supreme Court replacements during the last year of a presidency. Schumer himself, in a 2007 speech, expanded the waiting period to the final 18 months of a president’s term. 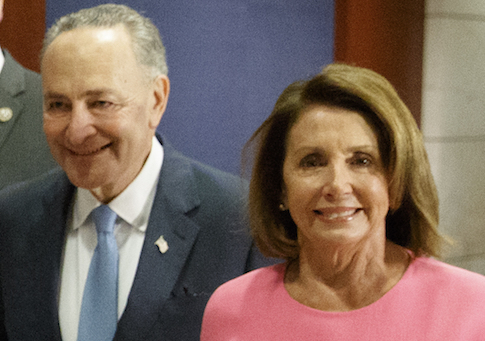 Now, despite a record of calling on the Senate to confirm the president’s nominees—as long as the president is a Democrat—Schumer has adopted the strategy of no Supreme Court confirmations at all. How does he think President Trump will respond? By caving? An attempt to filibuster the Scalia replacement may force McConnell to change the rules so that Supreme Court vacancies can be approved by a majority vote. And where would Democrats be then? Not only will they have lost the Scalia seat, they will be completely vulnerable should another vacancy arise in the next two years. And Schumer has a reputation for political savvy. The blanket opposition to president-elect Trump extends to his appointments at large. Democrats can thank Harry Reid for allowing executive branch officials and lower-court judges to be approved by a majority vote. But the Washington Post reports that Schumer wants to prolong the confirmation process so that some Trump cabinet officials are not confirmed until March. The reason: “Democrats have been troubled by a lack of personal disclosure by Cabinet choices that they say mirrors Trump’s refusal to disclose personal tax information during the presidential campaign.” The presidential campaign that, in case the Democrats have forgotten, Trump won. Reviving the issue of the tax returns makes little sense. It generates headlines but doesn’t move votes. And though it’s entirely possible that one or more of Trump’s nominees won’t be confirmed, I seriously doubt it. In every incoming administration there is a personal revelation or atrocious hearing that dooms a cabinet appointment. But hearings begin next week, whether Chuck Schumer likes it or not, and so far the quality of the opposition research against Trump’s picks has been remarkably blah. Yes, the first duty of the opposition is to oppose. And I don’t expect the Democrats to roll over for Trump. But I am surprised by their hysterics, and by their race to see who can be the most obnoxious to the new president. They seem to have been caught off guard, to say the least, by their situation. Take for example their willingness to stand on a podium beside a sign that reads, “Make America Sick Again.” By embracing this message, such as it is, the Democrats associated not Trump but themselves with illness. Who on earth thought that was a good idea? It takes time to adjust. The Democrats may be counting on inertia and the media to slow the Republicans down and force them into a defensive crouch. Worked in the past. But here’s the thing about Trump: He doesn’t play defense.